H.H. 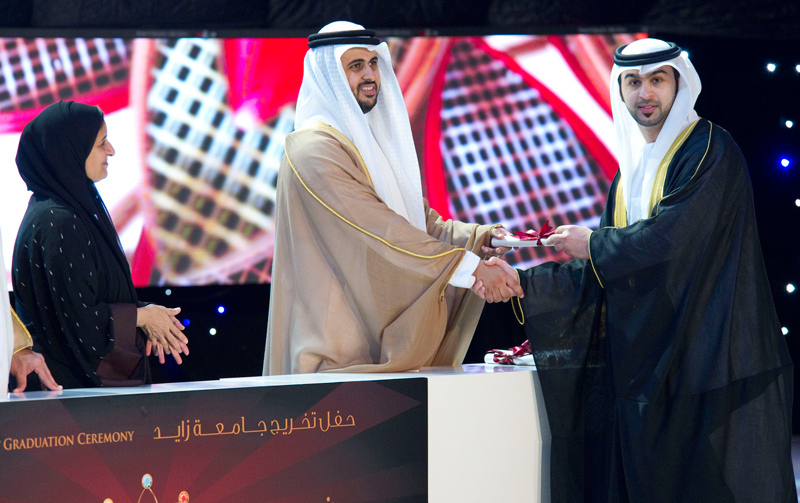 Sheikh Diab bin Mohamed bin Zayed Al Nahyan confers Graduation degrees upon 1272 Zayed University graduates. Homenews room2014MayH.H. 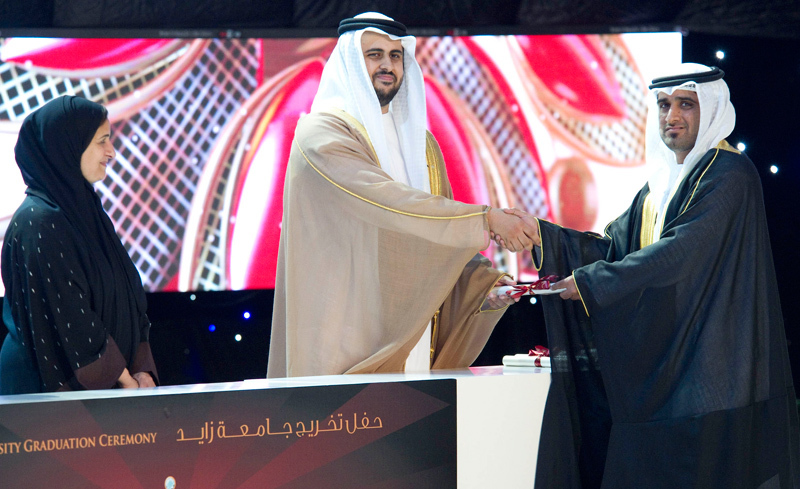 Sheikh Diab bin Mohamed bin Zayed Al Nahyan confers Graduation degrees upon 1272 Zayed University graduates. 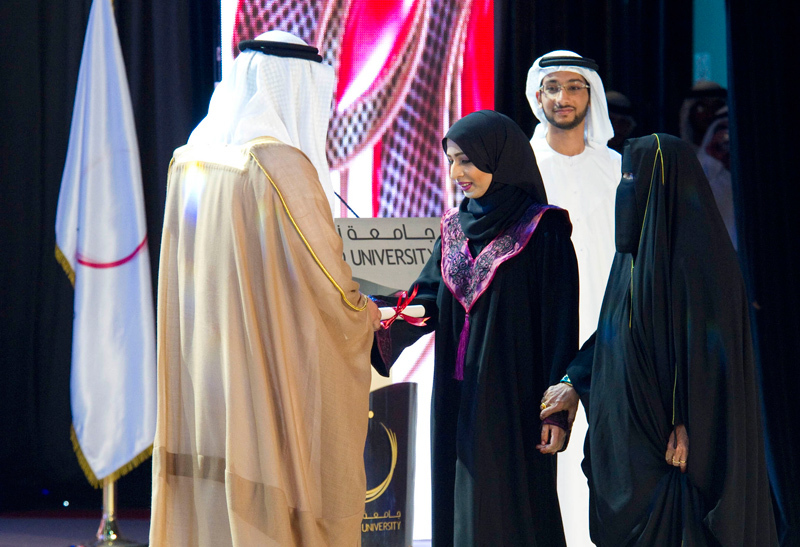 His Highness Sheikh Diab Bin Mohammed Bin Zayed Al Nahyan conferred graduation degrees upon 1272 Zayed University graduates, in the presence of Her Excellency Sheikha Lubna bint Kahlid Al Qasimi, Minister of Development and International Cooperation, President of Zayed University, and a number of officials who attended both ceremonies that were held at the National Theater in Abu Dhabi, on May 13 and 14, 2014. 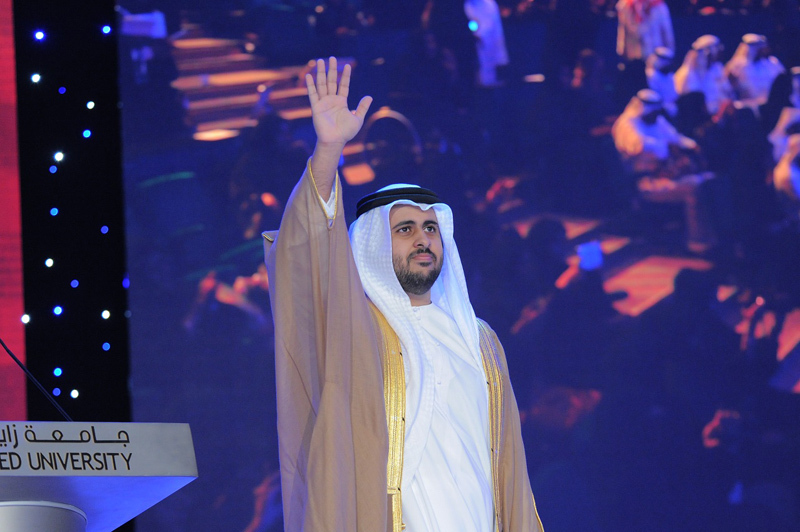 His Highness Sheikh Diab addressed the graduates congratulating them on their big achievement, and urging them to commit to greatness as they take part in the growth and development of the UAE. 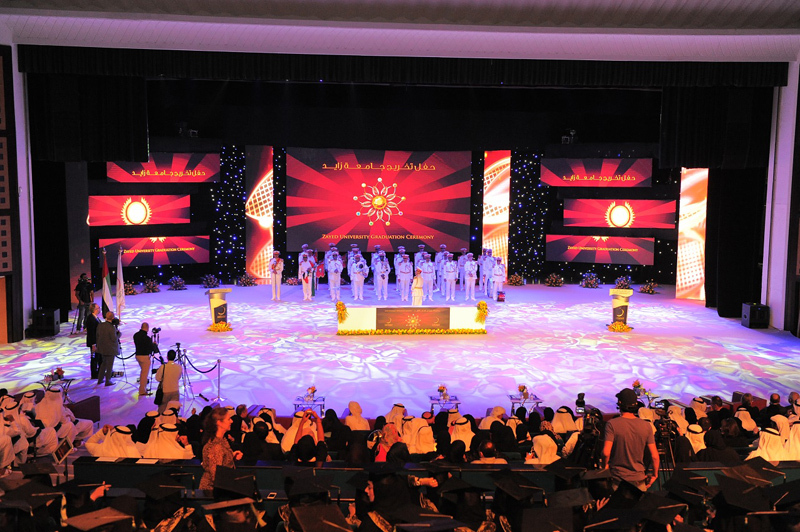 The honored graduates are the 12th cohort of Undergraduate students and a new batch of Master’s students from Zayed University in 2013, 815 of which are Bachelor students, and 457 of which are Master’s students. 209 Students graduated with Distinction / Distinction with Honors, 66 of which are Bachelor students and 143 of which are Master’s students. 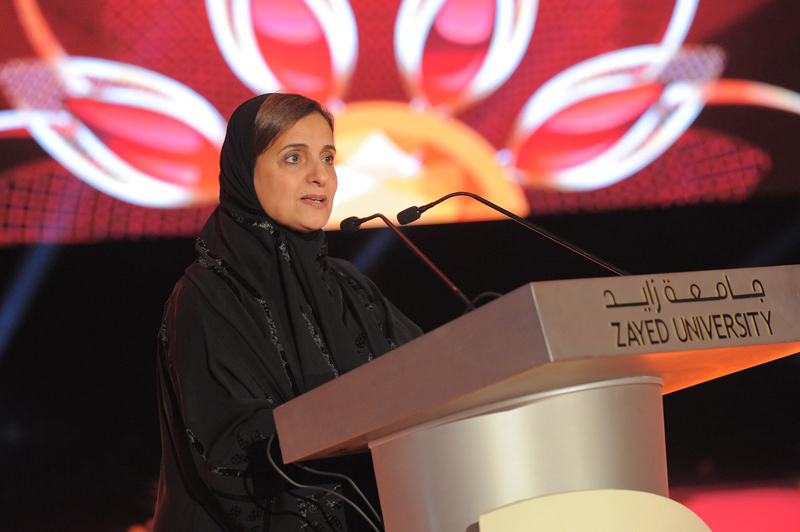 During her address at the Female Students’ graduation on the first day, Her Excellency Sheikha Lubna stressed on the great accomplishments that successive batches of Zayed University graduates have achieved, inspired by the wise leadership of the Founder of the Nation, late Sheikh Zayed bin Sultan Al Nahyan (may his soul rest in peace), and their Highnesses, the Rulers of the emirates, in placing women at the heart of their community, enjoying equal opportunities to education as their male counterparts. 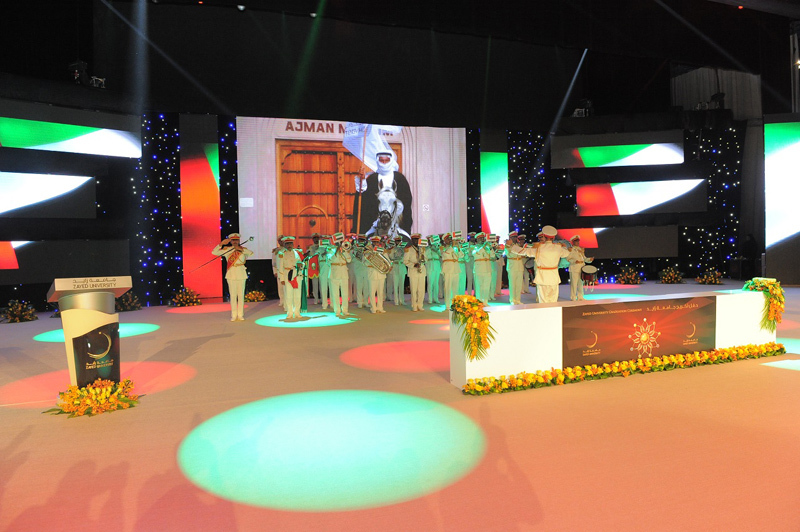 Her Excellency highlighted the fact that over the last quarter-century, the illiteracy ratio amongst women in the UAE has dropped by 17,7%, as women have been actively involved in the nation’s sustainable development process, growing to better heights in their pursuit of excellence, in terms of education, academic research, and sustainable national development, keeping pace with modern technologies, with remarkable public funds allocated to promote education in all fields. 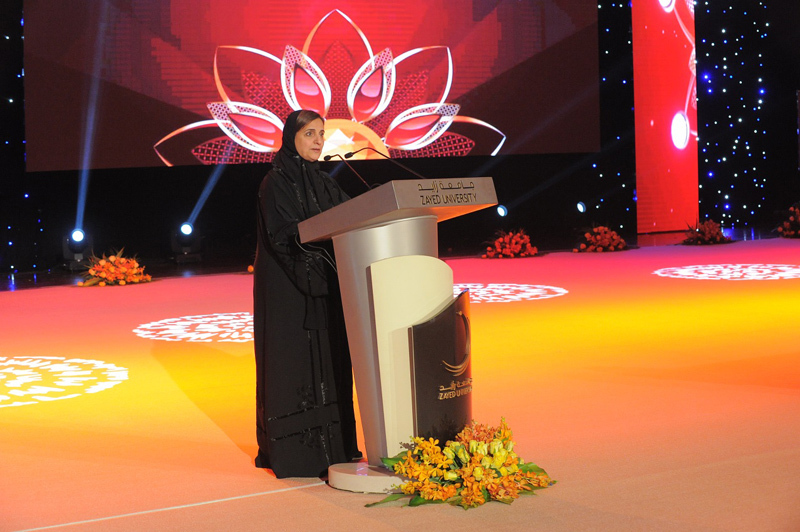 Her Excellency Sheikha Lubna also praised the unwavering support of Her Highness Sheikha Fatima bint Mubarak- Supreme Chairwoman of the Family Development Foundation, President of the General Women's Union – Chairwoman of Motherhood and Childhood Supreme Council (Mother of the Nation), as she continues, with her constant and strong determination, to be the symbol of the Emirati woman's development, and a living brilliant example of women’s capability to work and achieve, thanks to the endless initiatives of Her Highness to raise the status of women in all arrays. 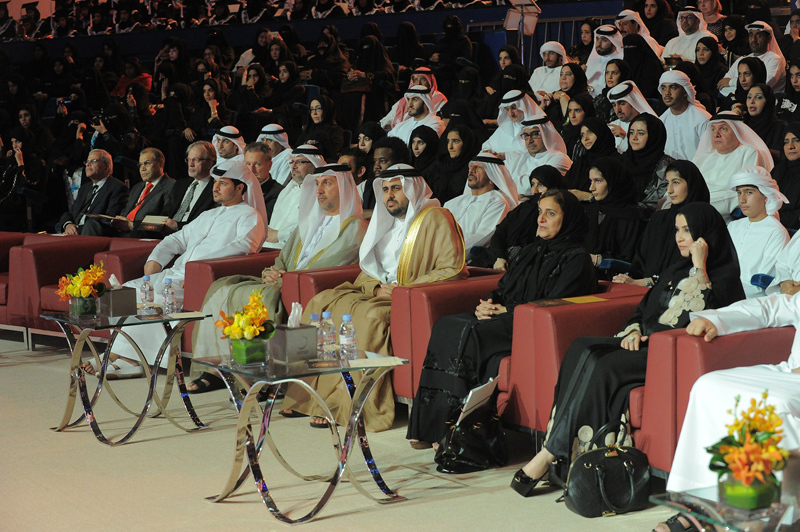 Her Excellency Sheikha Lubna, during both her addresses, also thanked Zayed University faculty and staff, for their dedication and hard work to prepare qualified graduates, support sustainable development and contribute towards strengthening the pillar of a knowledgeable society, and their strive to position Zayed University amongst the best universities, nationally and worldwide. She addressed the new graduates as well, urging them to always aim for being “Number One” in whatever they do, to lead a life of meaning and impact, and be willing to make a difference, as they are the ambassadors of the UAE in the world. Zayed University graduate from the College of Business, Mashael Al Qassimi, gave a speech on behalf of female students on the first day, and Zayed University Master’s Graduate in Diplomacy and International Affairs, Shehab Al Fahim, gave a speech on behalf of Bachelor male and Master’s graduates on the second day. 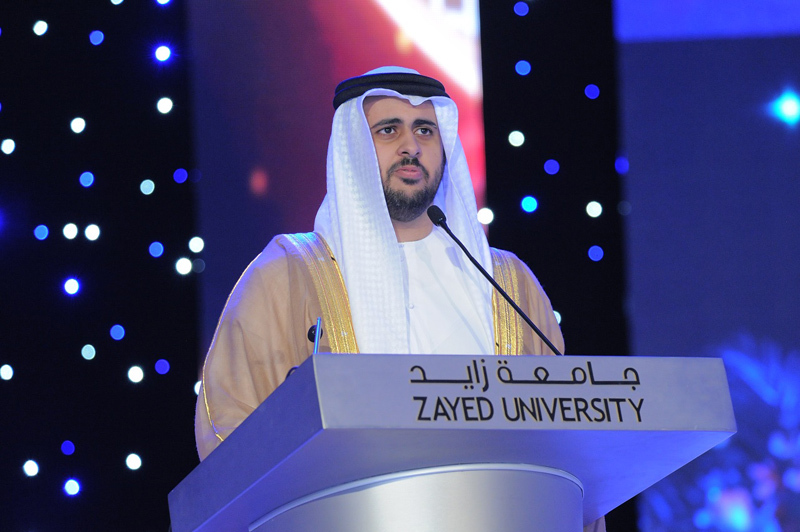 Both graduates expressed their thanks and gratitude to the great leaders of the Nation, to the Management of Zayed University, and to Zayed University Faculty and Staff, and vowed to lead by example and continue to commit to being of positive contribution to the development of the UAE. Since the inception of Zayed University, over 6,594 students have graduated with Bachelor (5,684) or Master’s (910) degrees. 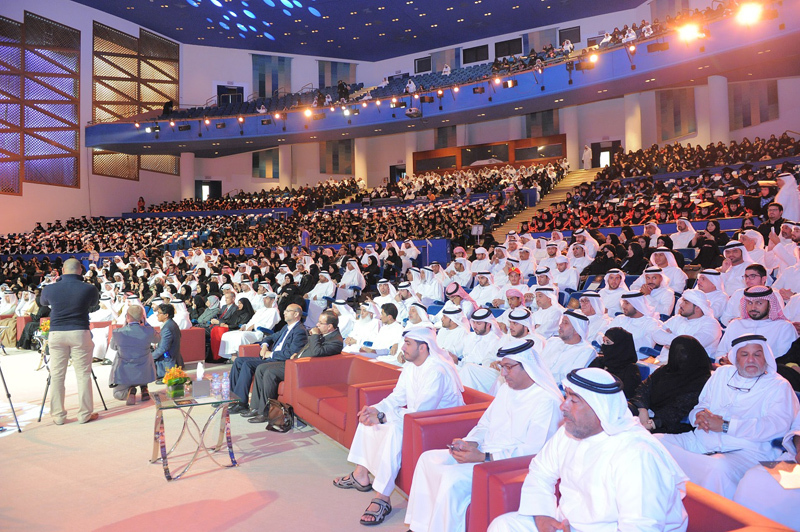 Currently, there are over 8,500 students currently enrolled in Zayed University on both campuses in Abu Dhabi (4,633) and Dubai (3,876), a number that increases by almost 20% yearly. Zayed University is one of only four universities in the Middle East and one of only sixteen internationally to earn and consistently maintain international accreditation from the Middle States Commission on Higher Education (MSCHE) in the United States.